Hundreds of young activists joined an inspiring Youth Climate Strike in Santa Rosa, to demand action on climate change. 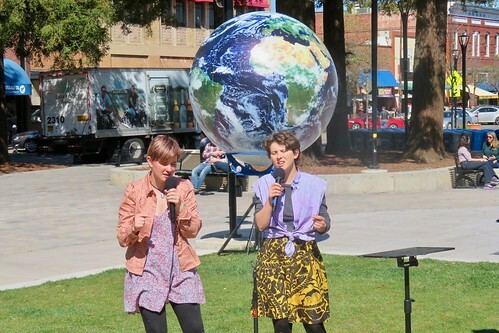 This North Bay strike was organized by young climate activists Lucy London and Kelley Tillman, along with their peers at the Novato High Earth Club. They gave speeches, sang together, made posters, marched on City Hall and created a beautiful mosaic to honor mother earth. Over a million students around the world skipped school this Friday to protest government inaction on climate change, with thousands of rallies in 125 countries, making it the largest youth climate action in history. Their peaceful demonstration in Santa Rosa was very moving: these young people are sweet, smart, articulate, dedicated and they share an amazing creative energy and love for the earth. I want to be like them when I grow up! In coming weeks, I will create a special video story featuring Lucy, Kelley and their friends for Climate Heroes, our new series on the new leaders of the green revolution. Even though this was a youth-led event, they welcomed the help of adult allies like us. It was a pleasure to join forces with these young leaders to fight for climate action together, across generations!